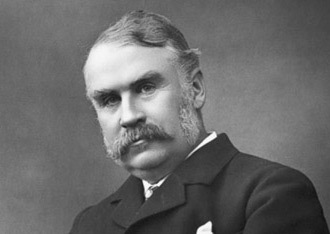 Sir William Schwenck Gilbert was an English dramatist, librettist, poet and illustrator best known for his fourteen comic operas produced in collaboration with the composer Sir Arthur Sullivan, of which the most famous include H.M.S. Pinafore, The Pirates of Penzance and one of the most frequently performed works in the history of musical theatre, The Mikado. These, as well as most of their other Savoy operas, continue to be performed regularly throughout the English-speaking world and beyond by opera companies, repertory companies, schools and community theatre groups. Lines from these works have become part of the English language, such as "short, sharp shock", "What, never? Well, hardly ever!" and "Let the punishment fit the crime."